For fans of lesbian romance novels, these 5 sensual and spicy books will get you excited turning the pages. Whether you're new to the lesbian romance genre or have been reading these books for a long time, you'll love what these steamy lesbian romance novels do to you. Perfect for the mind, body, and spirit! These 5 lesbian romance novels are available at Amazon, Google Play, iTunes, Barnes & Noble, and Kobo, as well as other stores. Click the links next to the books below to go to your favorite store. Or, just fire up your preferred reading app and do a search. You should have no problem finding these lesbian romance novels when you search. You will truly love these books. These lesbian romance novels are loving, well-written, sensual and steamy. Just read the reviews on Amazon. If you love sweet and spicy contemporary lesbian romance and lesbian fiction, you're going to absolutely fall head over heels for these books. Download them today and start reading right now! Looking to leave her troubled past behind her, Annie Arbuckle takes a restaurant job in the northern resort town of Traverse City, far away from everything and everyone she knows. Annie needs change, a break from the party girl life she had in Detroit, and spending summer in this small town of vacationers seems like the perfect way to get her life back on track. Then she meets Nora Lowe. Nora is a server at the restaurant, she's gorgeous, curvy, exciting, with a bit of a wild streak. Things don't always add up with Nora, she often seems to be hiding something, but Annie has a hard time saying no to someone so beautiful and so fun. And that can get her into trouble. Now, with new love on the line, will Annie be able to avoid falling back into old habits while maintaining her budding relationship with Nora? Or will the mischief and the secrets that Nora clings to push Annie over the edge? Secrets don't have to be wicked... and treasure isn't always what we expect it to be. Click Your Store To Read RIGHT NOW! Nadia Marek, a graphic designer and account manager at a boutique advertising agency, is about to have her work life flipped upside down. A major competitor has bought her company out and with this shakeup comes the arrival of a new CEO. Nadia's fears for the future of her job become more complicated, however, when she discovers how attracted she is to her new boss. That boss is Avery Wool, a confident and strong executive, who has come in to reorganize the company. But Avery appears to have ulterior motives. As the changes begin to take hold, things aren't always what they seem with Avery. Nadia, however, can't help but fall for Avery's advances. She's a beautiful woman, sultry, powerful, rich... and she has Nadia in her sights. How will Nadia reconcile her feelings about the corporate takeover with the growing desire she feels for her new CEO? Is the mounting passion between the women for real, or is it all just a game to Avery? Work often takes a backseat when you have romance knocking at your office door. When Jessica Coleridge arrives in Los Angeles to open her new yoga studio, the only person she knows in town is her old friend Liberty Logan. To Jessica's surprise, Liberty has become a famous television actress on a hit comedy show. As the friends rekindle what they once had, romance begins to flourish and this reunion between Jessica and Liberty quickly evolves into much more than friendship. But fame and money begin to play tricks on Liberty, as she's still naive to her growing celebrity. And with Jessica reentering her life out of the blue, Liberty has a difficult time determining what's real and what's just an act. When money and business get involved with love and romance, even old friends can let their emotions get the better of them. Will this second chance at love for Jessica and Liberty persevere through the trappings of Hollywood, fame, and money? Can these two women see past the noise all around them and accept their feelings for one another? Celebrity can be tricky and confusing, but love has the power to overcome it all... if only we can listen to our hearts. Evelyn Driscoll, famed novelist and professor at a small midwestern arts college, has been feeling lost. It's been over seven years since her hit book came out, her editor is clamoring for a new manuscript, and life in northern Ohio just doesn't compare to the literary world she once inhabited. Her love life feels like even more of a mess. Evie is really beginning to feel trapped. When one of her graduate writing students, the beautiful and talented Meadow Sims, makes her adoration known, Evie feels the passion she once had for life and love all start coming back. Meadow is smart, sweet, and she has almost completed a novel of her own. But Evie and Meadow must thread the needle carefully, keeping their romance hidden from a jealous rival student and the university administration. 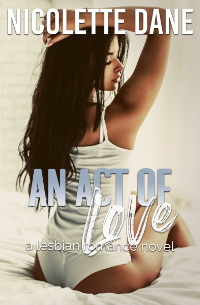 Can this love affair succeed despite the professional consequences? Will love win out over jealousy and prohibition? Blossoming love can be a catalyst for change, and accepting everything that change entails isn't always the easiest proposition. But it could be exactly what Evie needs. After getting into some trouble in the big city, Jane Cairns is sent to live with her aunt and uncle on the family farm. She's lost in life, worried, stranded, living in a state of arrested development as she ambles through her young adulthood. A normal twenty six year old woman should be able to flourish on her own, but Jane can't seem to make things work. Farm life begins to show Jane a different side when she meets Sally Harris. Sally is a proud farm girl, in love with her country life, and happy to work at her family's cherry orchard. Things can be a bit stifling in the country, however, when it comes to love. And coming out from behind that barrier isn't something Sally knows how to do. Each battling their own issues of identity and place, Jane and Sally struggle together to find out what it means to be free and happy. Will they be able to survive Jane's dirty past, secret love, family and friendship, and even death? Love is a tender and delicate thing, and it's something we all deserve. But the path to get there isn't always as straight as we might think. Subscribe to Nico's newsletter and get 3 FREE steamy stories emailed to you right now!